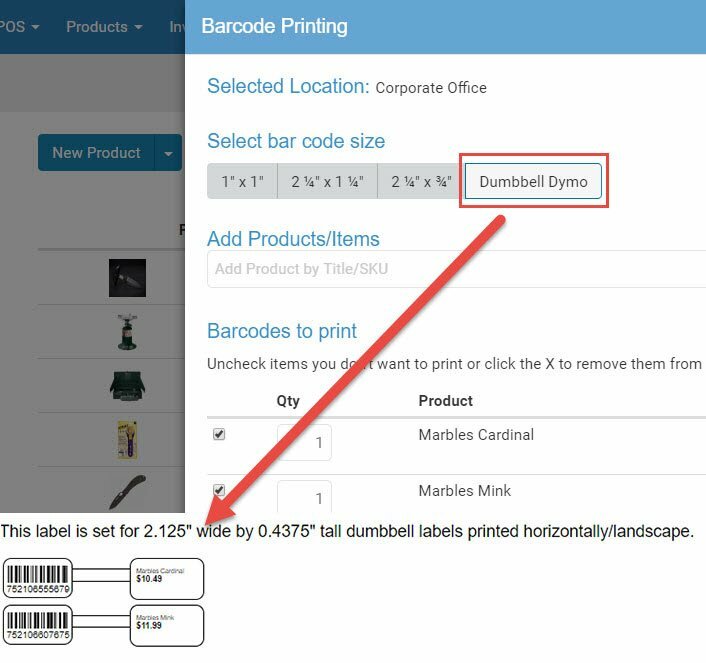 The Dumbbell Dymo barcode label is now an available option for barcode label printing for all store types. It was originally developed and deployed for jewelry stores because of their need to label very small items, but is being released for everyone since so many stores have similar needs. This label size only works with Dymo 400-series label printers. Made it so the serial number history of any particular serial number will now log and keep records of when the item changes condition level. This is useful in seeing the complete history of a serial number. 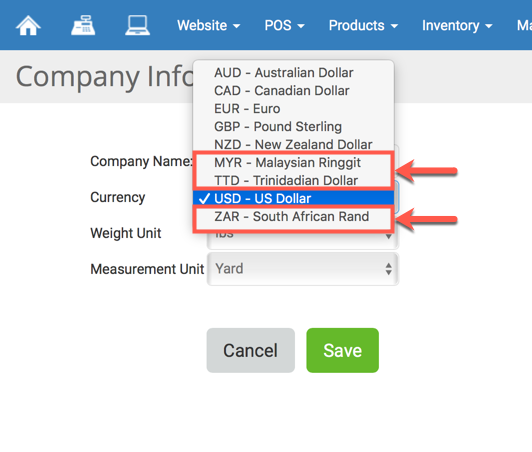 Added currency support for the South African Rand (ZAR), Trinidadian Dollar (TTD), and Malaysian Ringgit (MYR). Updated the checkout so that the entire shipping method button and text is now clickable as opposed to just the button. For times when inventory on fabric yardage gets down to odd fractions, we added the ability to edit fabric quantity in the Orders module to increments of 1/3 yards and 2/3 yards so inventory in those quantities can be used for filling web orders. Quantities in eighths-of-a-yard were already available. 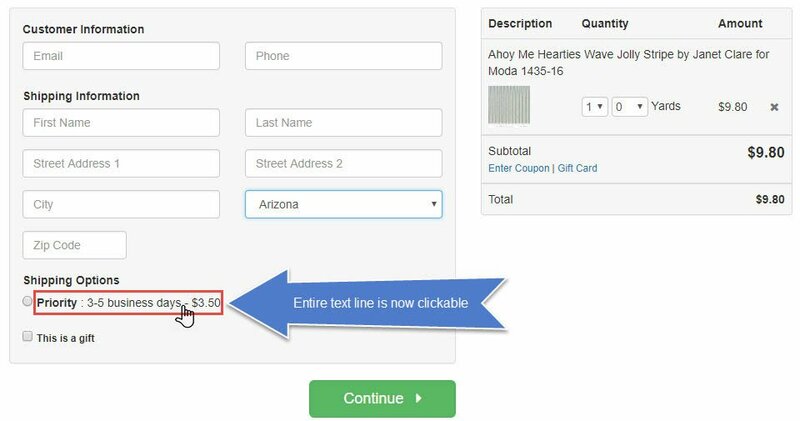 At present, in the online store, fabric will still be sold in quarter-yard increments, but we had many requests for the ability to fill orders with odd fractional amounts so we developed this feature to fill that need. Fixed the Existing Vendor Products list so that the Primary Vendor and Secondary Vendor filters now function properly. Fixed an issue where Descriptions were not saving for new products created within a Purchase Order or a Receiving Order. Fixed an issue where Vendor Packaging info added to a product wasn't being used or displayed when the product was added to a Purchase Order or Receiving Order. Fixed an issue where changing the Customer's Account Balance wasn't an available option in the Customer Actions panel in the Register (this is the panel that pops up when you click on any of the icons in the upper right of the Register). This only affected customers that did not yet have a credit or debit balance. Fixed an issue where Special Orders removed from a Purchase Order would cause the Special Order to get stuck in limbo, so no functional Status could be applied to the order. The system will now allow you to add the Special Order back to a new Purchase Order because the Special Order will stay in Draft Status when removed from a Purchase Order. Fixed an issue where in some cases, web orders paid solely by Gift Card, would show as Abandoned Cart on the web Orders page. Fixed an issue with the Precuts module where certain products wouldn't show up in the Search results. Fixed an issue where some products, when trying to add them through the Bulk Add From Catalog would fail and get stuck on an infinite load (this is when the screen doesn't load and the status icon will continue spinning indefinitely). Fixed an issue where you were unable to add multiple products from the Bulk Catalog. Even after making a large selection, it would only add a single product.